If you thought flying out of LaGuardia was rough, a group of airline passengers at a Siberian airport who had to had to get out and push their plane in temperatures of minus-61-degrees Fahrenheit this week has you beat. According to Russian news outlets, the landing gear on the Tupolev 134 froze in the bitter Siberian winter. “Let’s go,” passengers in thick winter coats shout and whoop as they put their hands on the wings of the plane and shove it several metres along the runway. “Everyone wants to go home,” one man says. The incident in western Siberia is being investigated. It took place on Tuesday. “Due to the low air temperatures, the chassis’s brake system froze and a tow truck was unable to move the plane onto the taxiway to carry out the flight,” authorities confirmed in a statement. 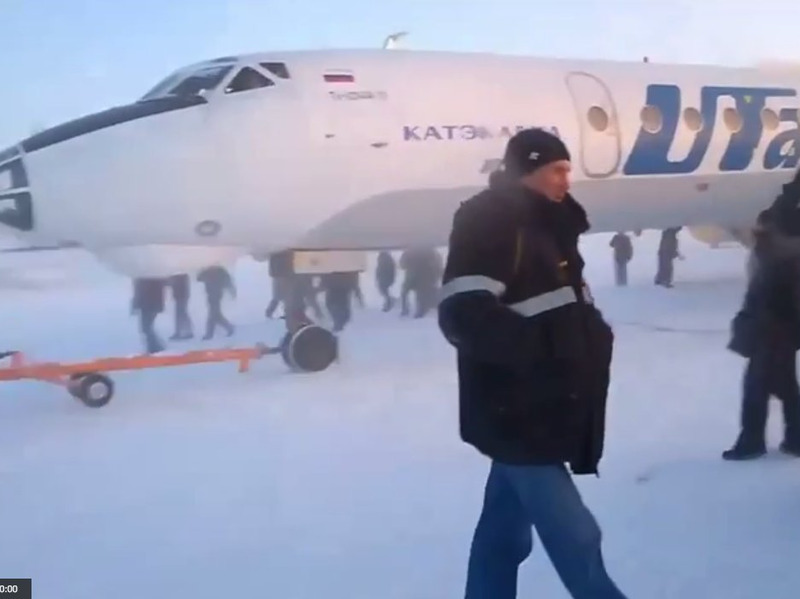 Even for Russians inured to long winters of sub-zero temperatures, the passengers’ can-do chutzpah has drawn awed admiration. “Siberians are so tough that for them pushing a frozen plane along a runway is a piece of cake,” said Komsomolskaya Pravda daily. The plane with 74 passengers on board was being operated by a Siberian airline called Katekavia, which is part of UTair group. It was flying from Igarka, around 1,750 miles (2,800 kilometres) northeast of Moscow, to the Siberian city of Krasnoyarsk. The technical director of Krasnoyarsk-based Katekavia, Vladimir Artemenko, acknowledged the incident took place to Rossiyskaya Gazeta daily. “That morning it was minus 52 (minus 61 Fahrenheit). The plane had stood on the runway for 24 hours and the pilots forgot to take off the parking brake. That caused the brake pads to freeze up,” he said. In 2012 a UTair plane crashed in Siberia, killing 29, after the wings were not de-iced.